The Spin number is 8, which for me is The Mill on the Floss by George Eliot ‘“ to be read by 2 May 2016. I’ve had this book for years, keen to read it after I’d enjoyed Middlemarch, and it has sat unread ever since. I was hoping for Framley Parsonage and have started to read it, so I probably won’t finish The Mill on the Floss by 2 May especially as it is quite long (535 pages in a small font – I think I’ll get a copy to read on my Kindle). I have MIll on the Floss on my shelves to read too. I’m slightly intimidated by it, which is silly, but there you go. I’ll be interested to see how you go with it. Oh, I’ll be interested in your take on that one, Margaret! 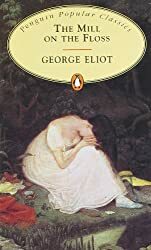 I still haven’t read anything by George Eliot. I hope you enjoy The Mill on the Floss even if you don’t finish it by the Spin date. I hope I will be able to take part in the next Spin, as I do love this feature.